Be prepared for my second review this week in which I obsess over the sheer awesomeness of a book I’ve just read. The characters of this book were wonderful! Ismae was such a strong heroine who knew her faults and played well with her strengths. She is immune to poison and sees the marque of Mortain before she has even been granted this “gift” by the sisters. This makes her stand out in a significant way and it is because of these gifts that she is able to really understand her worth in the end so she can stand up for what she knows is right. Her sisters in Death are pretty awesome as well, especially Sybella who you only glance at a few times yet she still stands out in a remarkable way. Now, let’s not forget about Duval. ::swoons:: ladies this is the man we have been waiting for! He is not a teenager infatuated with Ismae at first glance and even as they work together he does not overstep his bounds but instead gives her just what she needs when she isn’t even aware she needs it. I loved this. It’s no question Ismae has had some traumatic experiences with every man she has come in contact with so it’s not surprising that she is extremely untrustworthy of Duval through most of the novel. Duval isn’t so happy to be saddled with her either but as his feelings change he comes to appreciate who (and what) she is so he is able to understand her as no one has ever done. The actual romance though? So painstakingly slow in a way that literally had me holding my breath. So many of their moments together had me on the edge of my seat to the point where Duval grabs Ismae’s ankle and I heard myself give a girly “eep!” out loud. Plus he calls her “my fair assassin” in regular conversation! Love! Duval is dedicated to his family, country and has a fierce dedication to his friends that shows his loyalty in a beautiful way. Seriously, move over Mr. Darcy, methinks I have found a new literary husband! One of the things that had me thinking was the fact that this book had a ‘YA’ label. Don’t get me wrong I think it is a perfect read for YA readers and no, I don’t think that the themes are too “dark” for YA readers. However I do feel that there are some adults that will be wary to read this book due to the connotations that (they believe) go along with YA novels. This book had many adult themes and I am recommending it to a wide range of readers from YA to adult because I think it can be appreciated by them all. Also, there were some elements that were missing (ahem, bodice ripping) that would have made this a very adult book and though I am not complaining because slow burning romances are kind of my FAVORITE it is no question that the novel would have read a little different. I have to say that this novel is one of my favorite books of all time. There were so many parts of this book that reminded me of Juliet Marillier’s Sevenwaters series and those of you who know me (or who follow my blog) know that this is probably the biggest compliment I can give. The strong heroine, slow burning romance and ending that focused on what is easy versus what is right are only a few of the things that I find in both novels. The novel was a gorgeous read that I honestly can’t say enough about, I highly recommend it to fans of Juliet Marillier, strong heroines and anyone looking for a new brooding literary crush. I am so grateful to have received an ARC from Houghton Mifflin Harcourt via Netgalley and the only qualm I have is that now I have to wait an immensely long time for the companion novel, Dark Triumph to come out! This entry was posted in Reviews, YA Fantasy Challenge, Young-Adult and tagged assassins, death, fantasy, historical fiction, romance. Bookmark the permalink. I seriously am still giddy about this book, and am SO happy that you loved it as much as I did! R.L. 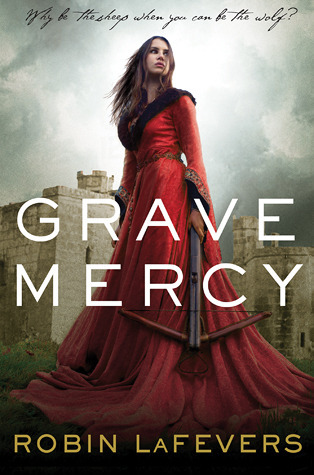 LaFevers actually had a really fantastic blog post this week about why she chose to write Grave Mercy as YA. She makes some fantastic arguments that I might have to employ myself in the future.I can't wait to find out what Sybella's 'gifts' are–I like that she's kinda crazy crackers, and am hoping for a somewhat unreliable narration. Eeep!!! I am so excited about the next book too. 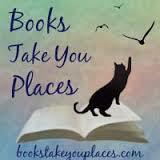 Loved your review:) You are so right about how amazing the characters are. Do you think Sybella will be linked up with a very large knight whom may not be dead? I DO think Sybella will be linked up with that mysterious knight, at least I sure hope so!! This book was so good! !